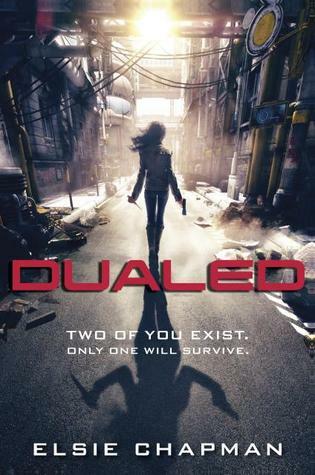 Dualed is a story about fifteen-year-old West Grayer, a girl who lives in a world where two of the same child are born every time, creating a world of Alts. Alt is a genetic Alternate, a twin that is born to another family in another part of the city. When the time comes, sometime before the twentieth birthday, the kids are activated and are put thru a mission. Kill or be killed. When West’s time comes, after a tragic accident, her whole world is turned upside down and then the adventure begins. I didn’t know what to think about this book when I first heard about the premise. I mean this is a story where everyone is a murderer. Think about it, every young adult and adult had to kill someone in order to live. But when I started reading, I was swept into West’s world and her struggle to survive. West is definitely not your typical fifteen-year-old. She’s been preparing to take on her Alt for years, with her brother and his best friend by her side. However, her world gets crushed and then instead of facing her Alt, West goes on the run. There were times during the story where I wished I could see a little bit more of West, of how she is feeling, but overall I could understand her struggles. While I loved West, I think I loved Chord a little bit more. I just enjoyed him as a character. He was sweet and tough, the perfect combination. The whole book I was just waiting for those part where he stepped back into the pages. The relationship between West and Chord was something sweet and real as well and I loved that. However, I have to point out the fact that I wanted the story a little more developed. I felt like the story was so focused on West killing her Alt but at the same time without giving us much of the back story or really any sympathy factor. Also, the whole thing with Chord could’ve been handled better as well, I would’ve loved more development in the characters and the story. Overall, this was a good story for anyone who likes science fiction and fight scenes. Dualed comes out February 26th, 2013. Let me know what you think.